Page Ives Lemel nudges open the door of a creaky wooden cabin her father built more than four decades ago. It sticks a bit on the uneven floor, but Lemel persists. Like many buildings at Brevard’s Keystone Camp—which celebrates 100 years this summer—this cabin was built by her family with a spirit of resiliency and self-sufficiency. As Lemel ducks into the rustic lodging, she’s following in the steps of thousands of girls who have spent cherished summer days and nights here, and continuing what’s now a full century of her family’s involvement with Keystone, the oldest girls’ summer camp in the Southeast. Lemel, Keystone’s director for the past 33 years, is from the fourth generation of her family that’s help lead the camp. Most of her earliest memories were formed on the property, not just as a camper and then staffer, but as a full-time resident. Her father, former camp director William Maner Ives, moved her family from Jacksonville, Florida, to Brevard in 1966, when Lemel was four years old. As she adjusted to the climate and started school, she quickly realized she was different from the other kids in town. “I stuck out like a sore thumb at school,” Lemel says with a smirk. She wore smocked gingham dresses, and even her underwear was hand-sewn by her grandmother. She describes herself as a very shy girl who spent much of her childhood with the animals her family raised on camp property. Her father insisted that they keep sheep, cows, and chickens, which Lemel helped butcher with her mother and younger brother. It was an experience that helped solidify her commitment to making the most out of her family’s land. Her father taught himself construction and how to maintain the family’s property as he went along, which made Lemel’s childhood especially adventurous. “I remember our first Christmas here when it was colder inside our house than it was outside,” she says. Her serious demeanor fades and her eyes crinkle as she recalls those frosty nights, when she would be bundled in so many layers of clothing she could barely move. The old summer cabin her father was converting into her family’s four-season home was decidedly in progress that winter. It was among many camp structures he renovated during his tenure. Caring for the property was, by then, very much a family tradition. Keystone Camp was cofounded by Lemel’s great, great aunt, Florence Ellis, and a friend, Franny Holt. The year was 1916, when great floods hit much of the Southeast. The torrential storms came just as Ellis was traveling from Jacksonville to WNC with eight young girls in her care. Railroad bridges were washed away, and the girls were hundreds of miles from home. The girls were stuck in Columbia, South Carolina, for one week, but soon the railroads were restored and they made it to the mountains. “The human spirit back then was one of great risk, great tolerance, and just roll up your sleeves and get to it,” says Lemel. Keystone’s first two summers took place on leased properties in Fairview and then Bryson City; the camp found its permanent home in Brevard in 1919. The spot was so close to the railroad line on Cashiers Valley Road that the girls would hop off the train and walk to camp with their little suitcases in tow. Though Keystone was the bedrock of Lemel’s family life, she never thought she’d become director. Her early jobs at camp were as a laundry girl and dishwasher, both of which she performed dutifully, even when she was a camper herself. She didn’t mind the work, but she didn’t anticipate making camp a career, either. “I never expected to be doing this,” Lemel says with a touch of bewilderment. “There was no consideration—no discussion ever—of taking over camp or running camp in the future.” After graduating high school, Lemel went to Duke University to pursue her dream of becoming a pediatric orthopedic surgeon. At first, she focused her studies toward pre-med, but a fateful trip abroad led her to shift gears. As she backpacked from Athens to London during her junior year, the collect calls back home were astronomically expensive, so she could only talk to her family a couple times a month. “It was the only summer I’d ever been away from camp,” Lemel says. “You talk about being homesick; boy, was I homesick.” With her heart tugging towards home, she finished her last semester at Duke in 1984 and was offered a job in the admissions department. But her father made a counter offer that stuck: Lemel graduated on a Sunday and by Monday morning, she was running the camp. When Lemel sits around the campfire with the current generation of campers, she always tells them about her journey from aspiring surgeon to camp director. “One of the things I try to talk to the girls about at camp is expecting life to throw you curve balls,” she says. Lemel says her immediate post-collegiate dive into the family business actually gives her a tinge of regret. If she could do it again, she would spend a year or two working for someone else so she could learn other management styles. It’s a lesson she wants to teach her daughter Catherine, who is currently attending Barnard College in New York City. Unlike Catherine’s two younger siblings, she has expressed interest in running camp someday, but her mother cautions her against jumping in too early. If she decides against becoming camp director, Lemel is confident that one of Catherine’s cousins could keep the camp in the family for a fifth generation. Lemel found her own approach to running camp over the years, and uses her similarly even temperament and high expectations to guide the girls in her care. She says she learns every camper’s name within the first 24 hours and fosters an environment where the girls can take physical and emotional risks to establish their independence. She’s rewarded by her campers for years afterwards, as they send her cards and updates. And generations of grandmothers, mothers, and daughters return for reunions, often bringing treasured mementos from their days at camp. For Lemel, the purpose of Keystone remains the same as when she was a camper: sharing a place where girls like herself can shed their shyness and honor their differences as they explore their place in the world. 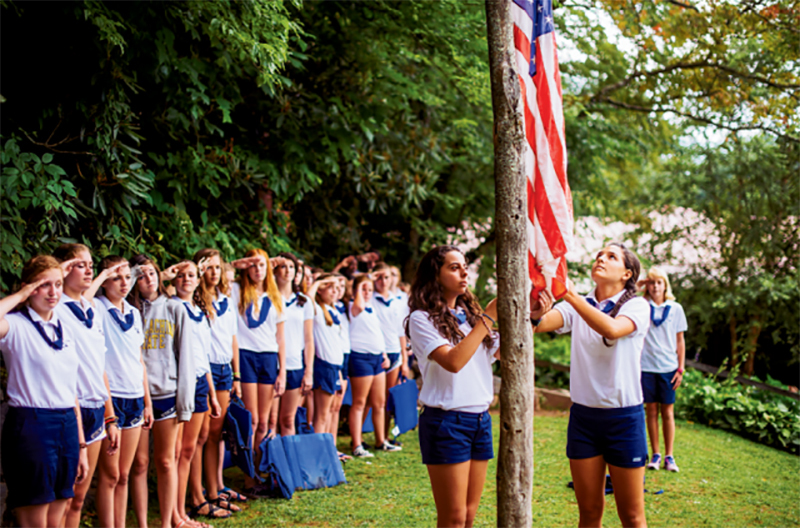 “When you come to camp, you get to be who you want to be,” she says with a confident nod. “It’s a world where you get to create who you are.